XMiL Workflow Tools is a long-standing developer of very useful tools for video editors. I’ve worked with many of their products for years. Recently, Rainer Standke, CEO of XmiL Workflow Tools, sent me a demo version of his latest software: Keywords. Keywords quickly lists all the keywords in a selected Final Cut Pro X project, event or multiple events. It works by either manually exporting an XML file, or using a free helper script to export an XML file. It then reviews the XML file and generates a list of all the keywords associated with each clip, along with a count of how often they are used. Finally, you can export this keyword list to a tab-delimited text file or a Microsoft Excel XML file. First, I went to the Mac App Store and installed the Keywords application. 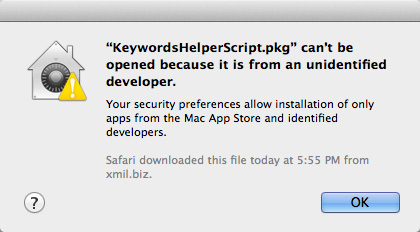 Next, I went to www.xmil.biz and downloaded a copy of the Keywords Helper Script. The Helper Script needs to be installed manually, though. After downloading the software, double-clicking the software displays this message. Theoretically, I should be able to install the app by clicking Open Anyway. However, in this case, nothing seemed to happen. In which case, read the next paragraph. To allow the installation, go to System Preferences > Security & Privacy and change the setting to Anywhere. I strongly recommend setting Security preferences to Mac App Store and identified developers — and only over-ride this setting on a case-by-case basis when you know you downloaded the software from a known good source, like XMiL. Installation of the Helper script is straight-forward and is similar to most other software that you’ve installed. When installation is complete, BE SURE to reset your security preferences back to Mac App Store and identified developers. This is really important. Don’t leave it set to Anywhere.